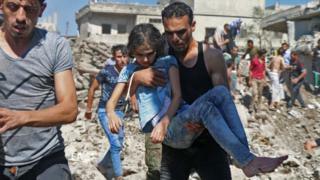 Syria's army has launched an assault on rebel-held areas of the divided city of Deraa, after making significant gains elsewhere in the country's south-west. State media said troops had stepped up their bombardment ahead of an operation to take the road linking Deraa with the nearby Jordanian border. Earlier, they cut in half a strip of rebel-held territory running north from the city by capturing two key towns. Some 45,000 people have been displaced by the fighting in the past week. The south-west has been relatively calm since last July because of a "de-escalation" agreement brokered by the US and Jordan, which support the opposition, and Russia, a key ally of the government. However, President Bashar al-Assad has set his sights on retaking it since defeating rebels in the Eastern Ghouta region outside Damascus in April. On Tuesday morning, Syria's state news agency Sana reported that the army and allied militias had seized the towns of Busra al-Hariri and Malihat al-Atash, about 30km (19 miles) north-east of Deraa. There was no comment from rebel sources, but the Syrian Observatory for Human Rights (SOHR) confirmed the government had taken the towns overnight and cut off a rebel-held area to the north of them. The UK-based monitoring group said the advance came after hundreds of air strikes by Russian warplanes and helicopters on rebel positions in the al-Lujat area. Later, state media announced that "terrorist positions and fortifications" in Deraa were being targeted "before military units advance into the south-eastern quarter". "The regime is seeking to take control of a military base south of the city, which will allow it to cut the route between Deraa city and the Jordanian border, as well as further divide the rebel areas," the SOHR's director, Rami Abdul Rahman, told AFP news agency. As well as being the main city in a region that borders Jordan and the Israeli-occupied Golan Heights, Deraa is where the uprising against President Assad began in 2011. At least 29 rebels and 24 pro-government fighters had been killed since troops stepped up air and artillery strikes on Deraa and Quneitra provinces last week, according to the SOHR. At least 32 civilians have also reportedly lost their lives. Many of those displaced are heading towards the border with Jordan, but its government has warned that crossings will remain closed and that it will be unable to host a new wave of refugees because of the strain it would place on its financial resources and infrastructure. The kingdom has already taken in 666,000 refugees registered with the UN since the Syrian civil war began in 2011, but it has said the actual number of Syrians in Jordan is closer to 1.3 million. Jordan has joined the US in calling for the "de-escalation" agreement covering Deraa and neighbouring Quneitra province to be preserved in order to prevent a wider confrontation between Israel and Iran. Washington has warned the Syrian government that it will take "firm and appropriate measures", but told rebel commanders that it would not intervene to protect them. Israel has vowed to stop what it considers Iran's military "entrenchment" in Syria and has carried out dozens of missiles strikes on Iranian military and militia positions, as well as weapons shipments. On Tuesday, Sana reported that two Israeli missiles hit an area near Damascus international airport overnight. It gave no details, but the SOHR reported that the Israeli missiles had struck a Hezbollah arms depot.